The new ETRI Model 125E EC axial cooling fan from Rosenberg features a long-life brushless DC motor with AC input power from 85V to 265V making it suitable for use in many US and European OEM product applications including VFD cooling, electronic cabinet cooling and refrigeration. The ETRI 125E electronically-commutated winglet-style cooling fan from Rosenberg USA. L10 life expectancy is 80,000 hours at 40 degrees C (104 degrees F). The new ETRI Model 125E electronically commutated (EC) axial cooling fan recently introduced by Rosenberg is easier to specify, performs better and offers longer life than competitive products. Its advanced design makes it a perfect choice for VFD cooling, electronic cabinet cooling and small refrigeration applications. 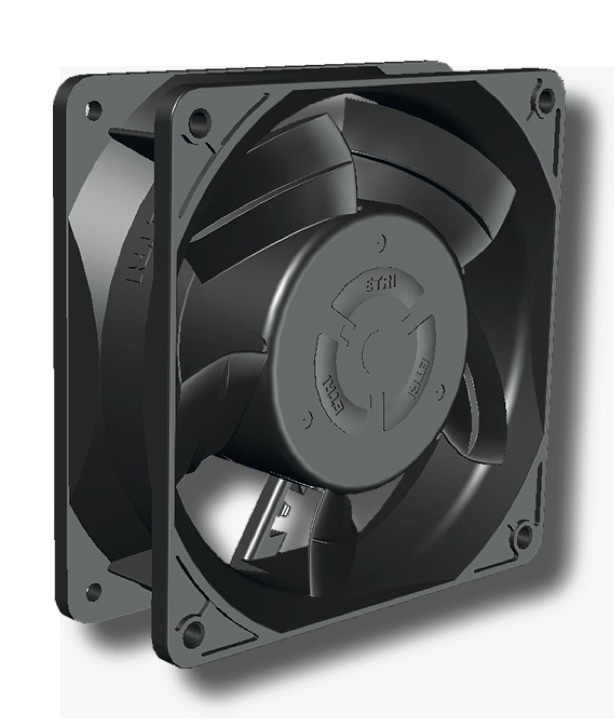 The compact 120x120x38 mm ETRI-brand fan features a long-life brushless DC motor with AC input power from 85V to 265V making it suitable for both 115V and 230V, or US and European OEM product applications. L10 life expectancy is 80,000 hours at 40 degrees C (104 degrees F). The operating temperature range is -20 to +70 degrees C (-4 to 158 degrees F). The new 125E runs at speeds up to 3430 RPM at a quiet 45 dB(A) and generates maximum airflow of more than 118 CFM, thanks to its winglet blade design. The housing and impeller are made from UL 94 V-0 plastic. Weight is less than 12 ounces. It is CE-approved and meets ErP 2015 efficiency requirements. Options include speed sensor, alarm and special construction to withstand salt spray, dry cold, wet heat, shock and vibration.